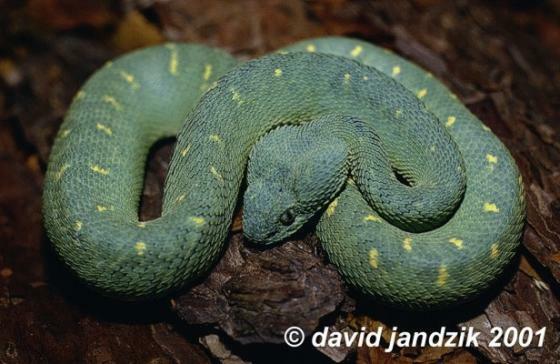 Can you confirm these amateur observations of Atheris chlorechis? Diagnosis Diagnosis (genus): Habitus slender, body laterally compressed, with high ventral and subcaudal counts and a short square head. Dorsal head scales small to moderate, more or less keeled; rostral fragmented, so that a wide shallow rostral is surmounted by 2-8 suprarostrals between the nasals and below the transverse series of internasals that marks the beginning of the dorsal surface of the head; transverse dorsal scale rows with frequent duplications or fusions as one moves from ventrum to dorsum; subcaudals single. Palatine-pterygoid articulation a simple overlapping joint; intra-pulmonary bronchus short. Type species: Vipera chlorechis PEL 1851 is the type species of the genus Atheris COPE 1862. Williams and Wallach 1989 list Toxicoa squamata COPE 1859 as the type species of the genus Atheris COPE 1862. See McDiarmid et al. 1991: 353 for a discussion of this issue. Synonymy: Kaiser et al. 2013 considered the generic name Woolfvipera Hoser 2012 invalid and rejected its use instead of Atheris. Etymology Etymology of genus: from Greek “athér” for the ear of corn, or generally “tip”, referring to the pointed scales. Greek “chloros” means green. ICZN Opinion 1634 (1991:84) states that Atheris is feminin, although Cope and others disagreed.